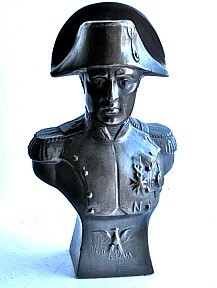 10% of your purchase in the Marketplace goes to support the work of the Napoleonic Historical Society. The items listed in the Marketplace below are offered for sale to Napoleonic Historical Society members and visitors to this site. All items are sold on a “first come, first served” basis. You can find NHS items for sale in our eStore. Engraving by Charles Williams, delineated by George Murgatroyd Woodward with original hand-colouring. Published 1 October 1807 by Thos Tegg 111 Cheapside. Napoleon issued the Berlin Decree in Nov 1806 forbidding his allies and conquests from trading with the British. By October 1807, Napoleon had seized most of continental Europe & Britain was left with only Sweden & Portugal as weakened allies. 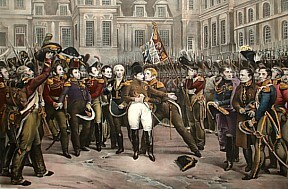 Napoleon’s Abdication at Fontainbleau. Framed aquatint with hand-coloring, circa 1860, on wove paper, published in Berlin, with margins. Nicely restored to fine condition. A bust of Napoleon, matching portraits of Napoleon and Josephione, and a small collection of buttons, being sold as individual lots. 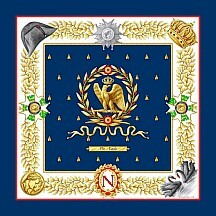 The Eagle brings together a rich tapestry of imperial symbolism and the Napoleonic legend: a golden eagle centerpiece, bees, insignias of the Légion d’Honneur, and the mythical hat. A pair of swans and a coin with the double profile of Napoleon and the empress Josephine celebrate their legendary love story. Made in France of the finest quality silk with hand-rolled edges, it measures 36 x 36 inches and is presented in a gift box with the scarf description. The ultimate Napoleon biography ‘for the rest of us!’ Humorous, well-researched, and easy to read, it’s a perfect gift for expert and novice alike. Signed by the author. $25 including postage to the USA and Canada. This book focuses the short critical period in 1815 between Waterloo and his arrival on St. Helena. This is a ‘must read’ book for anyone interested in the complete story of Napoleon! Signed by the author. 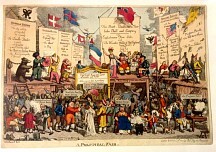 Although the Napoleonic Historical Society tries to ensure that only the most reputable dealers and sellers are represented on this site, this service is offered as a convenience for our members, and the Society accepts no responsibility for either the sellers or the merchandise offered on this page. If you would like to sell on this page, please contact the Market Place Director.